My name is Simmi and I’m a Whistles-aholic! It really is about time that I wrote something about my favourite purchase of the moment, since I’ve been gushing about it on Instagram for the last month. I seem to be constantly scouring the Whistles website and rushing into every Whistles store I come across to find more beautiful pieces like this one. They have totally got it going on from their gorgeous coats and gillets, to their colour palette, accessories, bags, dresses and cashmere - I want it all! This particular piece caught my eye immediately with its unique lilac-grey colour that worked really well against my skin tone. It’s so well crafted, as is everything from Whistles, and is definitely the warmest coat I own. I’ve really been enjoying wearing this gorgeous faux fur coat all around London both during the day and at night. It’s a statement piece for sure and adds a touch of glam to pretty much any outfit. I’ve received a lot of compliments on it from both friends and random passers-by! 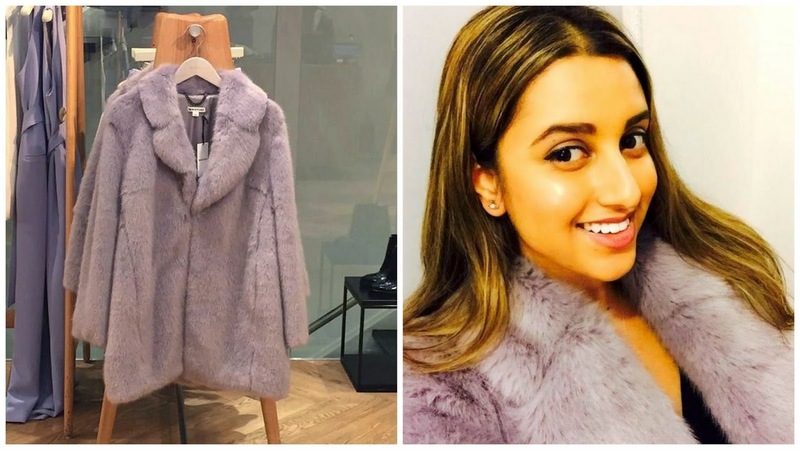 It came in at £275, which is a little pricey, but when it comes to faux fur I think quality is very important. They’ve got the same coat in a few other colours available on ASOS here.